The traps have been set, the bait left out and the Petersen girls have gone to bed filled with the excitement of what we might find in the morning. 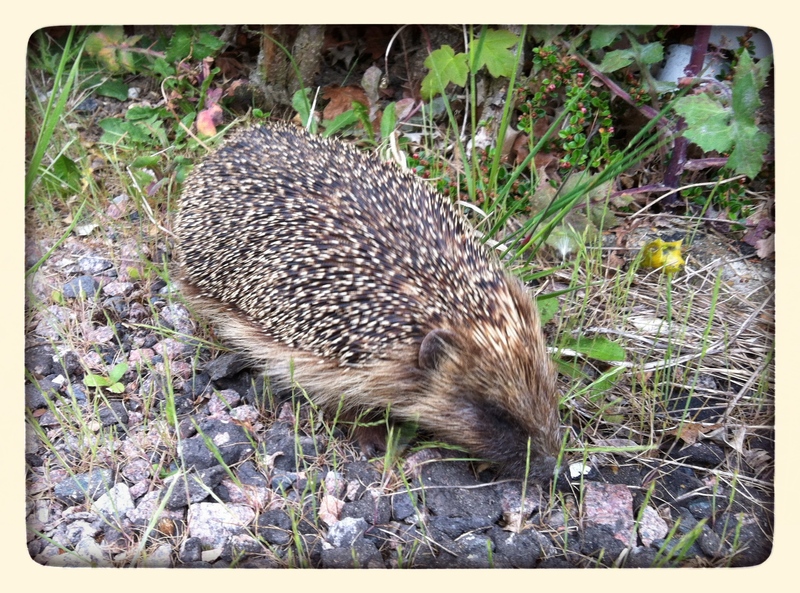 It all sounds a bit gruesome but in fact it’s all part of a “hedgehog survey” for The Mammal Society. We’ve decided to play detective and find out what mammals, other than hedgehogs, come out at night in the garden. We know they’re there…Bramble and Pixie have left a few “gifts” at the back door over the past few weeks, but we’ve spent the evening erecting “mammal tunnels” to try and record the Fishpond’s Nightlife! 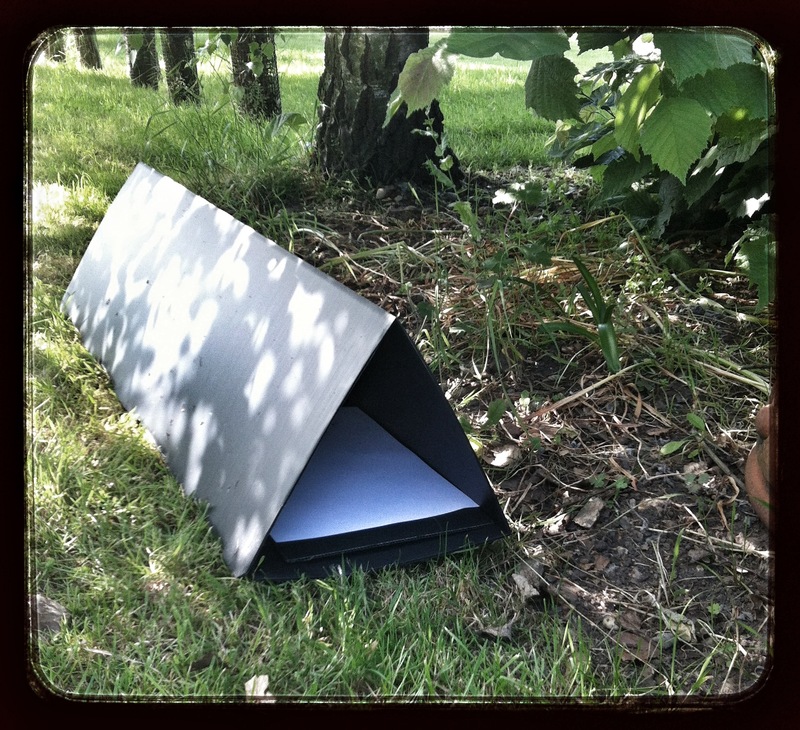 They were simple to make; a large sheet of black corrugated plastic fold ed into a triangular tracking tunnel. Using paperclips we secured a piece of plain paper at each opening and bait in the middle. At the edge of each piece of paper we stuck down masking tape and loaded it with ink made from poster paint and olive oil. We made two tunnels and Maddie carefully chose where to site them. One has been put next to a flower bed at the side of the lane, where Maddie thought she had identified a mouse hole. And the other is in long grass at the edge of a field. With any luck, the hedgehogs, mice, shrews and their other small furry friends will be tempted by the peanut butter, cashews nuts and dried apricots that were lovingly left out for them this evening. After feasting on our goodies, they will inadvertently leave a footprint trail as they scurry through the ink and across the paper. Part of me can’t help but think I will have two disappointed girls in the morning when we check for footprints and find blank paper. But we know there’s life out there……and we’re determined to track it. While Stu was taken breakfast in bed this morning in recognition of Father’s Day, one feathered father in the garden had a far from restful day. The swallows that have been nesting in the stables fledged this morning and daddy (and mummy) swallow have been busy throughout the day bringing insects for the chicks. This fabulous spectacle has been a father’s day treat we couldn’t have planned. It has been wonderful viewing. 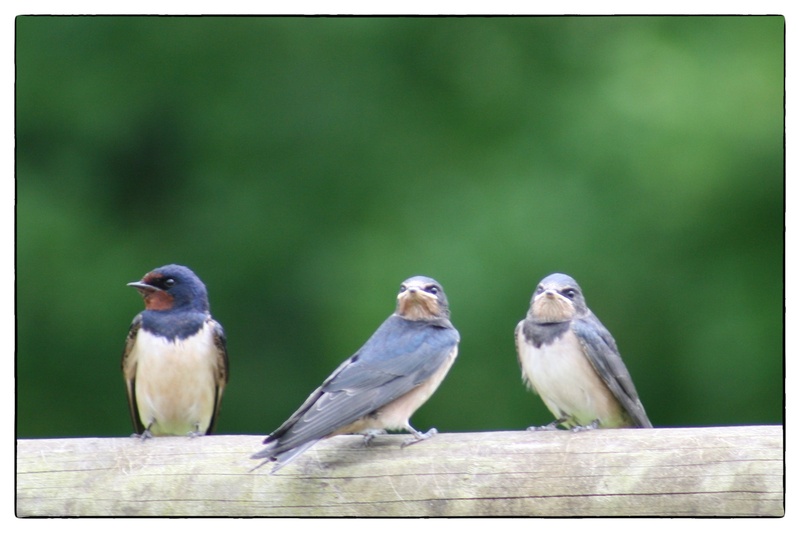 Over the past few weeks we’ve grown used to seeing the swallows swooping across the field, diving down low over the lawn and darting into the stables at full speed. But this morning, there seemed to be more activity than normal. 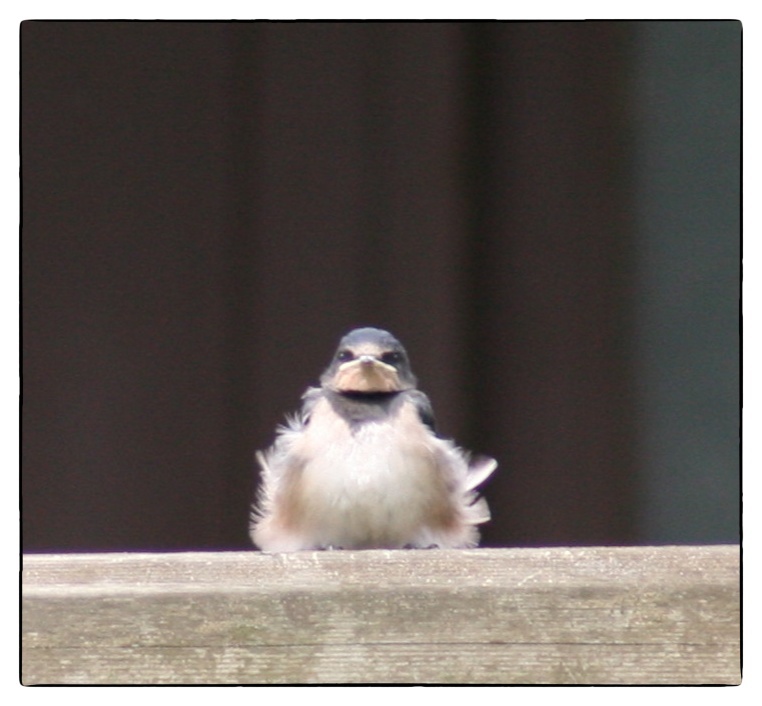 And as I looked more closely I noticed five, rather fluffy chicks perched precariously on the fence. I called Maddie and grabbed my camera, and we crouched behind a tree and watched in wonder. The chicks really looked too young to be out, with their fluffy down still visible. 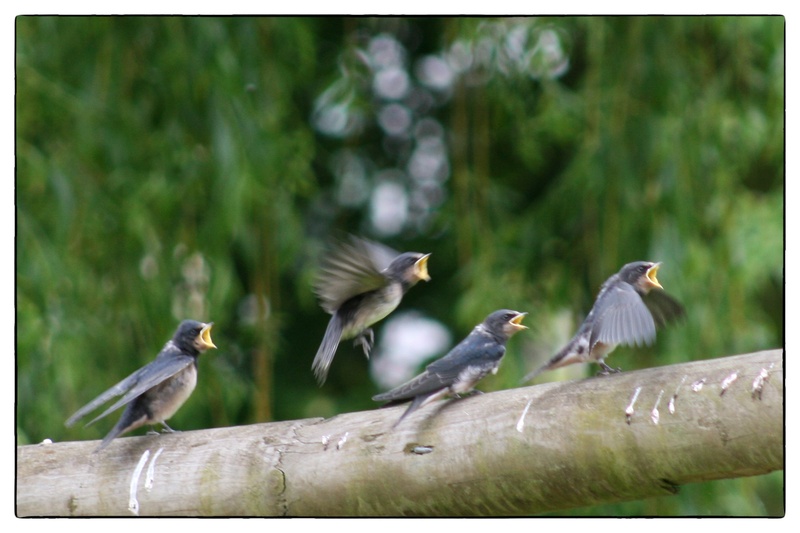 They haven’t yet got the distinctive colouring of the adults, and they looked a little wobbly on that fence. But they were alert and all watching intently for the parents, who were bringing them insects every couple of minutes or so. 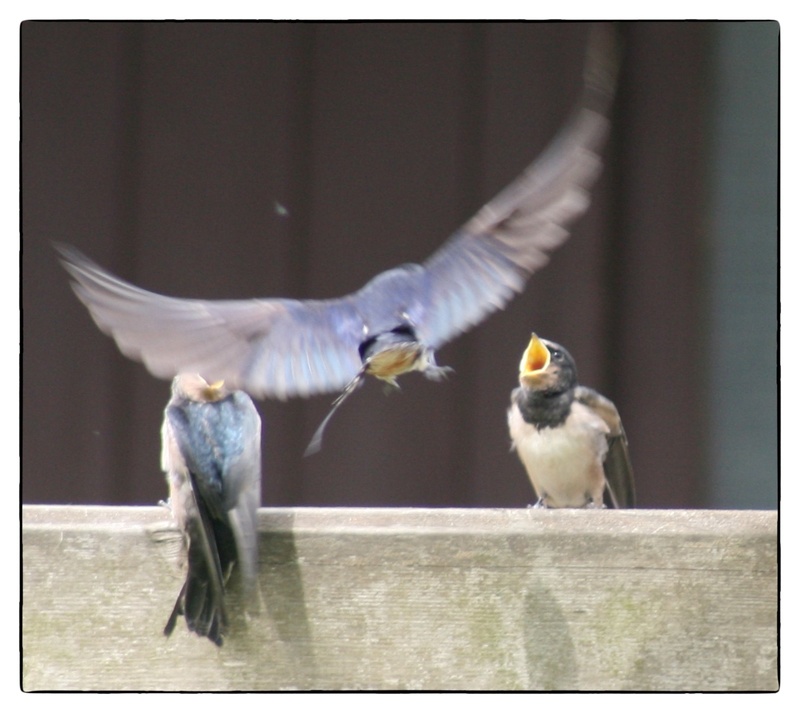 They were noisey too, vying for the parent’s attention enthusiastically each time they returned with food. And we soon realised that they could fly. As we tried to move a little closer, they all took off and the sky seemed filled with swallows. After a minute or two they settled again on the fence and lunch continued. Bramble noticed them too. She’s an accomplished hunter and I was worried for the chicks. I watched as she crouched low, slinking across the lawn to get a closer look. But Mummy and Daddy swallow were on the ball and both swooped fast and low at Bramble, missing her by centimetres and Bramble made a hasty retreat. By late evening, all the swallows had gone. I’m hoping that they’re just roosting back in the stable and that they’ll be out again tomorrow for some more enthralling viewing. When I met Stu, his nickname was “Forrest”. He loved running, and as he was growing up, his friends would often see him running round the village and shout “Run Forrest, Run!” from their car windows. I have never felt the same love for running. Vanity pre-wedding and post-baby had necessitated the use of a treadmill. And I must admit that the luxury of our own private gym at Mon Ami, without the judging eyes of superfit, lycra clad trainers, had meant that I did turn into a bit of a gym bunny. It was a good excuse to indulge in a soap opera or two as I pounded out the miles onthe treadmill. It became a habit and the fitter I got the easier it got. Stu, on the other hand, would still take any opportunity to run in the hills of the Nature Reserve next door than spend an hour glued to the telly in the gym. I have always found his love of outdoor exercise slightly odd as my limited experience had involved swallowing flies, avoiding dog poop and copious nettle stings. So it was with a feeling of fear and dread, that a few weeks after moving to Fishponds, the realisation that there was no gym finally dawned. If I wanted to maintain any kind of fitness, and work off the wine and copious fish and chips that had been consumed, then I was going to have to venture outside and run the gauntlet of cross country running. This was slightly different though. Running round the fields, I knew there would be no doggy doo, and no ramblers or dog walkers to dodge, red faced and breathless. So I downloaded Runkeeper and set off. I couldn’t find the headphones for my phone which was a blow. I had to undertake this chore in silence without any tunes to keep me going. A mile in and I had a revelation. The silence was golden. I could hear the birds singing, and creatures rustling in the hedges. I heard the church bells ringing from across the valley and the countryside revealed itself to me. I saw bunnies darting for cover as I approached. I watched swallows darting across the fields catching the evening midges for their chicks. I noticed that the pigeons wings squeak as they fly. I saw bluebells that I didn’t know were there and could smell their heady scent in the early evening air. 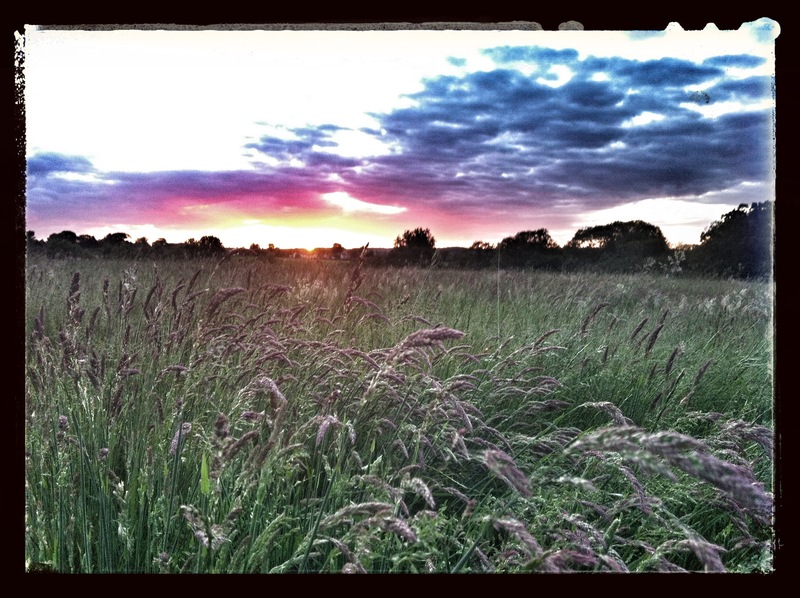 The tall grasses had a pink haze and seemed to shimmer in the evening sun. And I saw our resident barn owl swooping elegantly across the field. And I had time to think. My mind was clear and I started to make plans and mental notes, think through issues that I hadn’t had the time to deal with, and by the time the four miles were up, I felt like I’d done a whole day of mental admin. And so I am hooked. I’m not saying it’s easy – far from it. There are hills to deal with, molehills to dodge, the occasional deer to avoid. And I ache. But the lure of what I might see, the peace and quiet, and the feeling of achievement are addictive and I’m already looking forward to running the gauntlet of the cross country course tomorrow. It turns out that it wasn’t to see its flat mate. Although it could’ve been a close call. Maddie, Saffie and I were ready to stop traffic when we saw this little fella crossing the road but he made it across safely. Saffie and I had seen him on the way to collect Maddie from school. 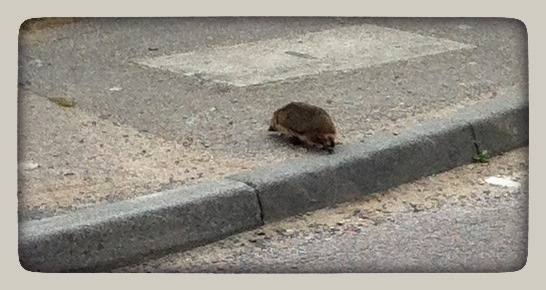 We followed him along the pavement for a while until he disappeared into a hedge. As we were telling Maddie about our exciting encounter, Maddie suggested that maybe that’s why they’re called Hedgehogs; because they live in hedges. So when we got home we googled it. And she was right. Apparently, the name hedgehog came into use around the year 1450, derived from the Middle English heyghoge, from heyg, hegge (“hedge”), because it frequents hedgerows and hoge, hogge (“hog”), because of its piglike snout. Luckily for Maddie he reappeared as we were talking about him, and we managed to get a good close look. So there you go. Not only did we get to see a bit of british wildlife that would normally require a night time stake out, but we also learnt something new. Ride on mowers. One of those things that men of a certain age dream of. I know Stu had tried and failed to justify the purchase of one at Mon Ami, but with 15 acres to tend, there was now no excuse not to hit the shops. The research was extensive ; bedtime reading was now the heavy plant machines of a John Deere brochure, not the fast cars of Evo. Discussions were had with anyone who knew about such things, and trips were made to specialist dealers around the south east. If he’d had paid as much attention to ordering the kitchen then he might’ve remembered the oven. But this was different. It had wheels. And then it was delivered. And i feared that I’d lost Stu to the fields. But in a moment of sincere benevolence, Stu asked if I’d like a turn? Millsy had already tried it out, and spent about an hour or so trundling up and down a field on it. But I was pretty non plussed. It was just another appliance for doing a job – and I spend enough time with the Dyson and the dishwasher thanks. But I accepted his offer, and was immediately hooked. 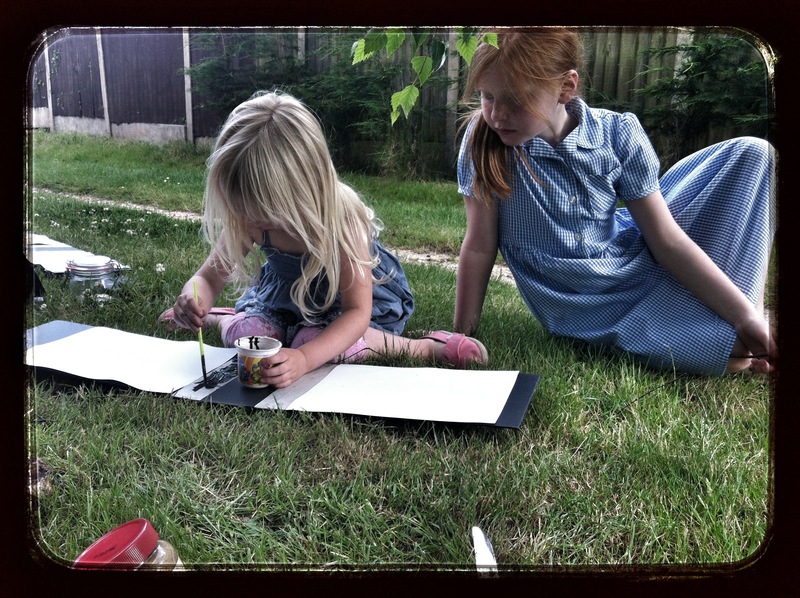 Saffie jumped on board and together we spent an hour in the sun whizzing round the fields. It was somehow exhilarating and relaxing all at the same time. The countryside seemed different being that little bit higher up; I noticed things I hadn’t seen before. We saw rabbits scampering for cover as we approached at speed, and even disturbed a rather magnificent pheasant who flew up out of the long grass right in front of us. Saffie squealed with delight the whole time, and i have to admit I finally understood what all the fuss was about. I’m brokering a deal with Stu now to swap ironing for lawn mowing. And if I succeed, and the stripes are a little bit wonky, then it’s because I’ll be making the most of this wonderful chore (and the drinks holder) and sipping a nice cold G&T as I mow. This is Lusty. Lusty Tubbs to give you her full name. She was on the patio when we arrived and we weren’t convinced that we’d let her stay. But we gave her a name. Our predecessor was Mrs Tubbs, and from the legal paperwork we discovered her middle name was Lusty. We loved it and so our Lusty Tubbs was christened. And she’s getting involved with life at Fishponds. 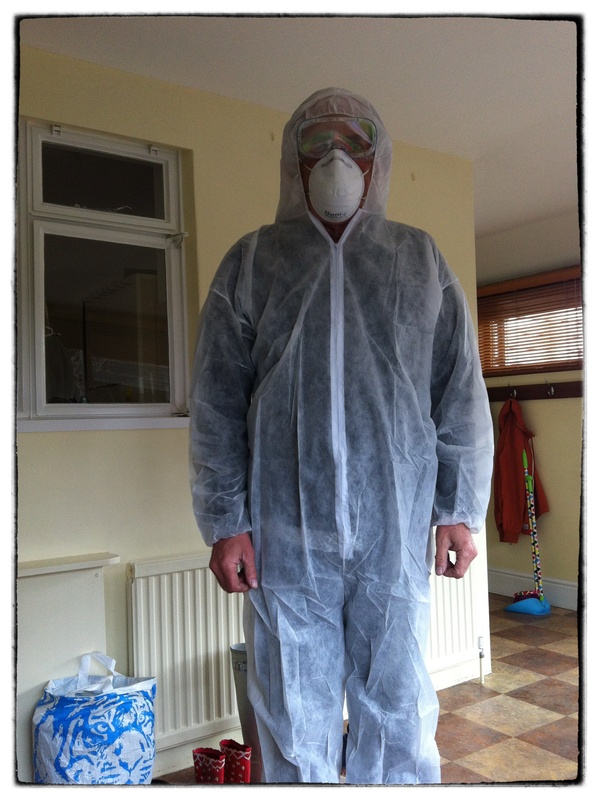 While we were kitted out in dust masks and goggles for the initial dirty work of pulling up carpets and ripping out kitchens, Lusty too was seen in goggles and a mask. Last week she was suddenly sporting a red bucket as a hat – we’re assuming this was Millsy’s work before he headed off to the desert in Abu Dhabi. Do we need a statue of a scantily clad female at Fishponds? I guess the answer is yes, and reckon Lusty is here to stay.